CALVINISM This is the teaching that is based upon the theology of the Protestant reformer John Calvin. In this system, God’s sovereignty is foremost even in personal salvation. Jesus died on the cross for the salvation of only the elect—those whom God had predestined for eternal life (a definite, or particular atonement). Salvation depends upon predestination, not human decision, though human decision has its necessary place in the process. Since God ordained the salvation of individuals, they cannot fall from salvation. The so-called five points of Calvinism were actually responses drawn up in Holland at the Synod of Dort in 1618–1619 to oppose five points put forth first by Jacob Arminius (see above). Generally, those traditions called reformed, other than Lutherans, have been Calvinistic. The Huguenots from France and the English Puritans (and therefore the early settlers of New England) were Calvinists. Notable Calvinists have included the Baptist John Bunyan, the Anglican George Whitefield, the Congregationalist Jonathan Edwards, and the early 20th-century prime minister of the Netherlands, Abraham Kuyper. 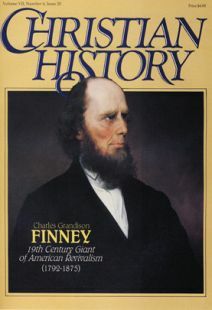 Finney was a descendent of the American Calvinist tradition, and was criticized for distorting it. He rejected the notion of personal predestination to salvation, and emphasized the role of the human will. Though Calvinism is often criticized for eliminating the place of human responsibility in salvation, making God out to be a tyrant, Calvinists have generally considered the relation between God’s predestination and human choice to be a mystery, and have not wanted to neglect the role of personal decision. NEW MEASURES Methods used by Finney in his revivals that caused controversy. They included using “anxious benches” at the front of the church for singling out those under special conviction; informal public praying, which was considered disrespectful; protracted meetings, which were regular meetings, maybe for months, and which some felt disturbed the church order and undermined the local pastor; and allowing women to pray in public meetings in mixed company with men. It’s important to keep in mind that these were disturbing in Finney’s day because they were viewed as biblically unwarranted gimmicks and innovations. Certain of these techniques were seen as disruptive to dignified worship, and as emphasizing human choice and emotionalism. REVIVALISM The practice of having planned times set aside in the year for special evangelistic and rededication services. Though the Church has always experienced revivals, many have argued that this modern approach undermines local pastoral influence and the role of regular evangelism through weekly sermons, and confuses emotional responses with genuine conversion. It is, however, an accepted approach, especially since C. G. Finney. PERFECTIONISM A theological teaching that states that perfect obedience to God is attainable in this life by faith. Since God demands of us to be holy, it is argued, it must be achievable. It does not mean (except in some extreme forms) that we can become sinless. Crucial in this teaching is that sanctification (holiness, obedience) is by faith, not by works. This means that we must overcome sin not by human effort and struggle, but by, in faith, submitting to God and allowing him to deliver us from sin. Finney was a promoter of perfection and was strongly criticized for it. (It is helpful to realize that Finney believed Romans 7:7–25 could not be about a believer, because a real believer, in his view, would not struggle with sin in that way, but would, by faith, be delivered from it. Traditionally, however, Romans 7 has been seen as dealing with the struggles of a believer.) This doctrine has found a place in the so—called “victorious life” teaching, and has been a major part of the Keswick Movement and fundamentalism. TOTAL DEPRAVITY The Calvinistic teaching that mankind is corrupted by the Fall in every area of his being, including the will. Therefore, man is dead in sin and cannot, by his will, choose God. GOVERNMENTAL ATONEMENT A view about the death of Jesus Christ that says that Christ, by his death on the cross, simply fulfilled God the Father’s requirement of punishment for sin, making it possible for people to save themselves by believing and becoming holy. NATURAL ABILITY The teaching that humans have a natural ability to obey God. The reason that people reject God is not that they must, but that they want to. Sin is a moral problem. People are, therefore, without any excuse for rejecting God. They can believe, but they won’t. Previously, people were called upon to repent, but, it was believed, only by an act of God would they become converted. However, Finney, though emphasizing natural ability, did not accept the idea that conversion was a miraculous work of the Holy Spirit, and saw it as simply a rational human decision. IMPUTED, or ORIGINAL SIN The teaching that all humans inherit, by descent, the actual original sin of Adam, and the punishment it deserves. Finney rejected this and taught that individual humans are only responsible for their own sinful actions. IMPUTED RIGHTEOUSNESS, or HOLINESS The teaching that the righteousness of Jesus Christ, shown by his total obedience to the Law of God, is transferred (imputed) to the believer upon conversion. Therefore, Jesus’ perfect obedience makes up for the failure of humans to be perfectly obedient. Finney rejected this doctrine and argued that humans themselves attained holiness, or perfect obedience, by faith. For him, a person had to be holy to be saved; holiness was not achieved by obeying the Law, but by faith. POSTMILLENNIALISM The position that the millennium will arrive on earth before the return of Christ. This view has been held by many in the Church, and was the dominant view in Finney’s day. This was Finney’s belief and motivation for his social reform ideas, for he felt that Christians were called to bring about the perfection of society. BAPTISM OF THE SPIRIT A teaching, now associated with the Holiness Movement and modern Pentecostalism, that a second experience is to come to an individual after conversion—like Pentacost came to the Church after Calvary. Though later many saw speaking in tongues as proof of such an experience, for Finney and those around him, the baptism of the Spirit was more a second work of grace that elevated one to a higher relationship with God, that transformed one to a higher plane, to holiness of life, and greater effectiveness in God’s service; it was not believed to be attended by miraculous signs. THE NEW DIVINITY The theology that was developed in New England by the followers of Jonathan Edwards, and which was based upon Edward’s thought. The leader in this development was the minister Samuel Hopkins, who had been a student of Edwards. This movement camel under attack by many because of its innovations and changes, and became associated with Yale College and the very influential Nathaniel Taylor, who made radical adjustments to some of Edward’s stronger Calvinistic teachings. In the religious atmosphere of Finney’s time, there were the older, and more traditional Calvinists, and there were the usually younger, more “progressive” New Divinity men. Finney’s ideas borrowed much from the New Divinity, which some have argued was New England Calvinism being reshaped by the import of Arminian Wesleyan teaching and practices.